Sometimes, when he was smaller, people used to tell Neil Gaiman not to make things up. He never listened. Now he’s written more than twenty-five books and has been given dozens of awards, many of them been given dozens of awards, many of them astonishingly ugly. He’s written television drama and for movies, and for comics. He’s even written “non-fiction”, which he learned is only marginally less made-up than the fiction. Sometimes he thinks about finding some of those people who warned him of all the awful things that would happen if he kept making things up, and finding out if it’s happened yet, or is still going to happen, and whether he should buy a tin hat and thick boots for protection. In the meantime, he grows pumpkins and keeps on making things up. And the much longer version…. 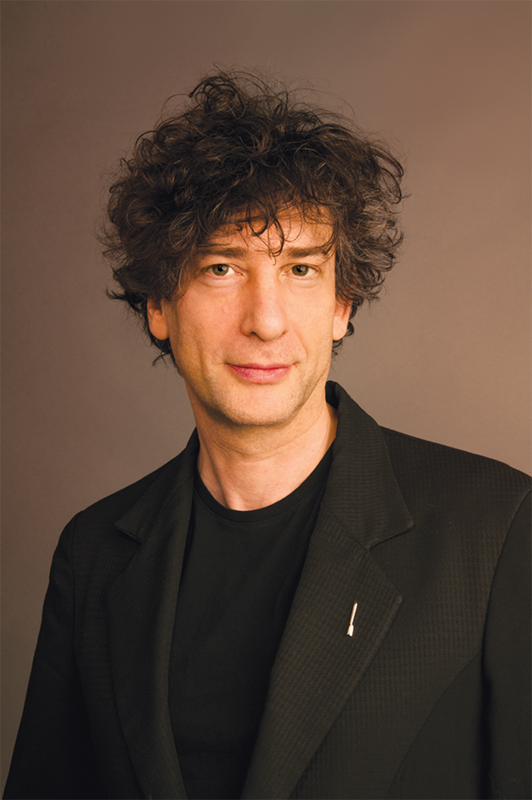 Gaiman began his writing career in England as a journalist. After a few graphic novel collaborations with artist Dave McKean, the groundbreaking series ‘Sandman’ followed, collecting a large number of US awards in its 75 issue run, including nine Will Eisner Comic Industry Awards and three Harvey Awards. In 1991, ‘Sandman’ became the first comic ever to receive a literary award, the 1991 World Fantasy Award for Best Short Story. He is credited with being one of the creators of modern comics, as well as an author whose work crosses genres and reaches audiences of all ages. He is listed in the Dictionary of Literary Biography as one of the top ten living post-modern writers and is a prolific creator of works of prose, poetry, film, journalism, comics, song lyrics, and drama. He is the author of many highly acclaimed and award-winning books for children and adults, including the New York Times #1 bestselling and Newbery Medal winning novel The Graveyard Book, and the bestselling Coraline, New York Times bestselling The Sleeper and the Spindle (illustrated by Chris Riddell); Fortunately, the Milk (illustrated by Skottie Young); Stardust; and Odd and the Frost Giants. He is also the author of the picture books Chu’s Day, Chu’s First Day of School, and Chu’s Day at the Beach, all illustrated by Adam Rex; Blueberry Girl and Instructions, illustrated by Charles Vess; The Wolves in the Walls, The Day I Swapped My Dad for Two Goldfish, and Crazy Hair, illustrated by Dave McKean; and The Dangerous Alphabet, illustrated by Gris Grimly. He is also the author of the Sandman series of graphic novels. Among his many awards are the World Fantasy Award, the Hugo Award, the Nebula Award, and the Bram Stoker Award. An animated feature film based on Gaiman’s ‘Coraline,’ directed by Henry Selick and released in early 2009, secured a BAFTA for Best Animated Film and was nominated for an Oscar in the same category. Q What makes a good graveyard and do you have a favorite real-world graveyard? I think trees and wildness make a good graveyard, and the feeling that nature is out to reclaim its own. And peace. The best graveyards are such peaceful places. My favorite graveyards are Highgate Cemetery (West), Abney Park (Stoke Newington) and Glasgow Necropolis. Q What is the most frightening book you ever read? Strangely, books never frightened me. Short stories frightened me, I think because so much happened before or after the story, and there was so much to know. I was terrified as a boy by Charles Birkin’s story “The Harlem Horror” (about a couple whose daughter had been turned into a circus freak by a mad scientist), and Manly Wade Wellman’s “School for the Unspeakable,” which I read in one of the Armada Books of Ghost Stories, published for children. I just finished a book called The Irregulars, about Roald Dahl’s wartime exploits as a British Spy in America. Great fun. Q What other books would you recommend to a young reader who really loved The Graveyard Book? I’d point some of them at The Jungle Book, by Rudyard Kipling. I’d point them at anything by Diana Wynne Jones. And Terry Pratchett’s books for children, as well. Also, if they haven’t read Coraline they should. I forget who wrote it, though. Q If you could be a character in another author’s imaginative world, where would you want to live? I’d like to go on a road trip from Narnia to Oz. I could stop off in Ursula K. Leguin’s EARTHSEA and Roger Zelazny’s AMBER on the way. But, I don’t think I’d want to be anyone else’s character. Q How do you feel about seeing film or stage adaptations of your stories? I pretty much always enjoy them. Sometimes I shake my head and wish they had done something a different way, but mostly they just make me happy—it’s a wonderful thing to see creative people take an idea of yours and try to make it real. Q Which character from your books is your favorite? I don’t think I can answer that. But I love Delirium and Merv Pumpkinhead and Silas and Anaesthesia and the Little Hairy Man in STARDUST—the kind of characters who never stand in the spotlight, but who make the book work. Q Why do you look different all the time? In every picture of yours you look like a different person. Q How do you pronounce your last name? Is it gay-man or guy-man or something else? Q What is your sign? It’s a painted piece of wood with Beware of the Mongoose on it… oh, you didn’t mean that sign. I was born on November the tenth, 1960, which makes me a Scorpio Rat. Q Do you have a fan club? How can we join? There used to be a sort of unofficial fan club and info service called the MAGIAN LINE, but once the web started and information was easy to find it drifted out of use. Q Are you Lemony Snicket? I promise I won’t tell if you are. Come close. Closer. Okay. Lean over here. Now…. I’m going to whisper. Nope, closer, so only you can hear…. …nope. I’m not. Q Why does it say ‘critically acclaimed and award winning’ every time your name is mentioned on your books? It’s a formal title. Like The Honorable, or Mister President. My full title is Critically Acclaimed and Award Winning Author Neil Gaiman. But because we’re friends you can call me Neil for short. As a child I liked to explore the gardens and grounds of old, empty houses in the town I lived in. Now I like exploring stories best. Q What’s your favourite monkey? Probably the colobus. It’s something in the eyes. Q Why do you and Clive Barker and my dad look similar and not appear to age? I could tell you. But then Clive Barker and your dad would have to kill me. Q Are you friends with Clive Barker? How did you meet him? Ever read his book, THIEF OF ALWAYS? Clive and I have been friends for about eighteen years now. We met because people kept mistaking us for each other, which puzzled us as we don’t look much alike. I put off reading THIEF OF ALWAYS for years, because I was afraid it would be too much like CORALINE, and finally read it a few years ago when I was asked to get involved in the film adaptation, and was relieved that it wasn’t. Good book. Q Dear Mr. Gaiman, How do you know Lemony Snicket because he is one of my favorite authors? I don’t know the mysterious Mr Snicket, but I am fortunate enough to know his associate, Mr Daniel Handler of San Francisco, who is charming and delightful and the accordion player for the Magentic Fields. Q If you could be any of the characters in your books, which would you most like to be? Which one has been most like you? Well, there are a lot of them who are pretty much me — lots of narrators of short stories, are as me as you can get. But there’s bits of me in all of them. I’m not sure I’d want to be any of the ones I’ve written. But there are a few in books I’ve not yet written whose shoes I’d like to inhabit for a while. Q If you had the opportunity to turn into a piece of fruit, what kind would it be? A pomegranite, I expect. Or a mango. I don’t know. When it comes to signings, I go where the publisher sends me. If they say ‘Go to Peoria’ to Peoria I shall go. Q Which book was the hardest for you to write? ANANSI BOYS. I got stuck for months in the middle. Q How do you keep yourself motivated to finish a story instead of hopping off to a fresher idea? I quite like having more than one thing on the go. Then when I get stuck on one thing I can go and mess around with something else. Q Do you have any unfinished novels? If so, will you finish it? There’s a book set in the STARDUST world called WALL, which I began before STARDUST and will finish one of these days, really. Q If you could write a book with anyone in the world, who would you write with? I’d love to write a book with Roger Zelazny, or with my friend John M. Ford, but I would want them alive again so we could collaborate. I don’t know. I love what Diane Wynne Jones does. Q Which of your books was the most fun or interesting while writing it? AMERICAN GODS was the longest. So it probably had more interesting bits and more bits that made me wish that I wasn’t a writer any more and that I could go and get the kind of job that didn’t involve making things up. Q When writing a story, do you prefer to write it first, then transpose it onto the computer? or do you entirely write your stories on the computer? Depends on the story. I often use the computer for the second draft, so that what I type in is slightly better than what I wrote by hand. Q Would you ever consider writing another book with Terry Pratchett? Because Good Omens was great!!! Glad you liked it! Terry and I like it too. I can’t imagine that we’d ever do it again, though. Q Are you ever worried that you will introduce a world to children that is too horrific for them to handle? Q Would you ever consider co-writing something with Jane Yolen? Q Have you ever thought about writing a book with Stephen King? I think that would be a bit intimidating. When I read his last short story collection I thought it might be fun to write an audio thing. Q I think it might have been a short story of yours that got me thinking this way but I always connect cats with angels? Do you remember a story like that? And how many cats do you have? You may be thinking of a story of mine called THE PRICE. Q Are you going to have a continuation to AMERICAN GODS? Maybe one day. And there’s a book called ANANSI BOYS which may sort of do some AMERICAN GODS things in a different direction. Q What’s the best advice you have for aspiring writers? WRITE. FINISH THINGS. KEEP WRITING. Q When thinking of a story premise, where do you get your ideas from? And, for quite some time, I’ve been wanting to write a novella, after reading THE SANDMAN: DREAM HUNTERS, and I was wondering, how do you start off your stories, and how do you think of your clever dialogue? I start off a story when I know where it begins; and the dialogue is something I mostly do by being quiet and listening. Q What do you do when you have writer’s block? I cheat and write something else in the meanwhile.